Telluride’s festival allure: balmy summer weather and spectacular mountain views. Photo by Merrick Chase. Bluegrass guitarist John Cowan croons into a microphone on a cool, sun-washed June day in Telluride, Colorado. The bluesy rhythm of drums, guitars and fiddles, slow and sweet as molasses, settles over a crowd of swaying people. Leather-faced cowboys, graying hippies with long braids and skirts, and college students in trucker hats undulate like grasses in a sea of blankets. Behind the stage, mountains carpeted with pine and aspen rise into a sky dotted with billowing clouds. “I wish I were so far away …” croons Cowan, sturdy and sandy-haired, eyes half-closed. It’s a haunting, soul-catching tune, and yet I disagree: There’s nowhere else I’d rather be. 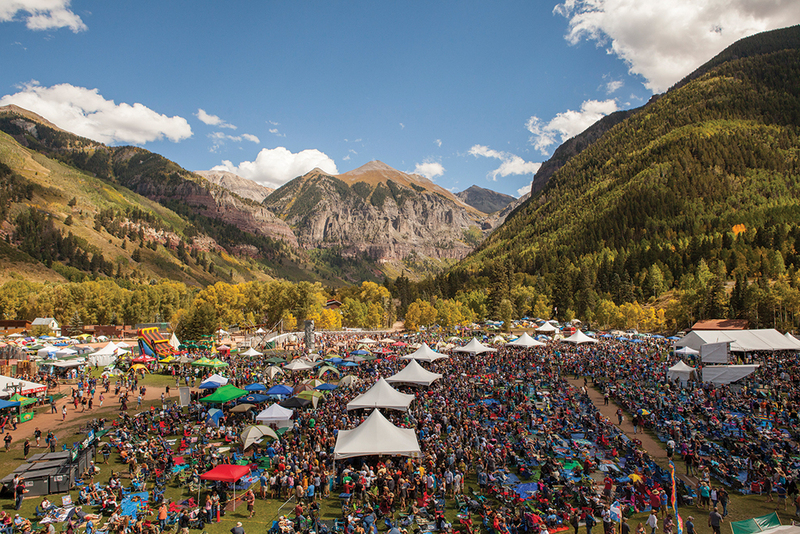 This is Telluride Bluegrass, one of the Southwest’s most beloved and longest-running music festivals. Telluride, once a humble mining town, has built a reputation as one of Colorado’s top ski resorts. But the tony Victorian hamlet commands an even broader appeal in summer, when it hosts a festival — sometimes two — every weekend but one between May and September. The most famous fests center around music — blues, bluegrass, jazz, classical — and take over Town Park on the outskirts of downtown. Other themes range from plein-air painting to ballooning, yoga, film, architecture and cars. Each celebration brings a different cast of devotees, but they’re all here at least in part for the same thing: to enjoy what they love in a setting that lifts the spirit and blows the mind. Tucked in a precipitous box canyon at nearly 9,000 feet, Telluride’s summer is brief and precious, which is why festivals have an air of almost feverish delight. After a long mud-season slumber, the town awakens around Memorial Day, when shopkeepers dust their shelves and flowers peek up in front of dollhouse Victorians. As snowmelt emboldens the waterfalls, the sounds of moving water echo through the canyon. Mountainfilm, a four-day festival with a lofty tagline — “celebrating indomitable spirit” — has kicked off spring in Telluride for 38 years. 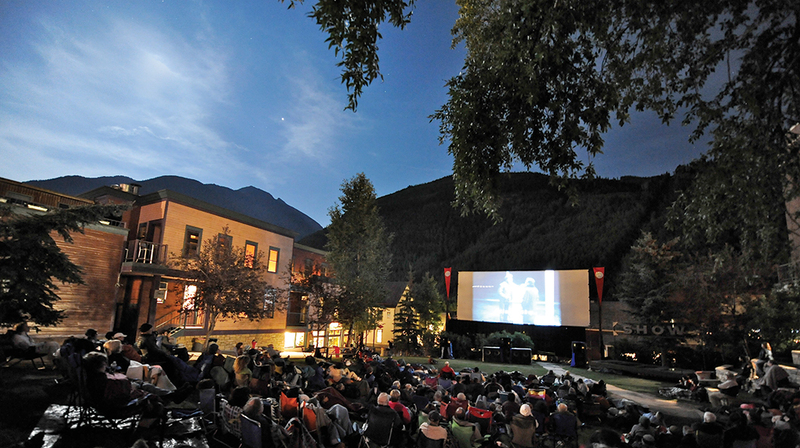 The event’s 75 or so movies showcase mountains and the people who love them, as well as social and environmental issues. Young filmmakers, professional athletes, best-selling authors and movie buffs brighten the streets in their candy-hued down and Gore-Tex jackets. Steaming coffee mugs in hand, they swap stories about the latest film in front of a tableau of melting mountains, all without a whiff of pretention. Perhaps it’s the big-hearted films or the freshness of spring, but a contagious optimism suffuses this early fest. Bluegrass is June’s biggest attraction, luring the largest crowds of the summer. By July, wildflowers plaster the meadows in pink, red, yellow and white and the aspens shimmer with their crowns of trembling silver dollars. The Ride Festival, with artists like Beck and Ben Harper, makes way for yogis taking over the streets for Telluride Yoga Festival, the oldest event of its kind in the country. Practitioners in tights and jewel-tone tops clutch yoga mats and cups of tea as they walk between classes, guided hikes, and meditation sessions. Some perform downward dogs alfresco on paddleboards, slack lines, and mats spread out in high meadows. In late summer, afternoon thundershowers depart as swiftly as they arrive, inviting a buffet of edibles to sprout in the forests, from strawberries and blueberries to prized chanterelles. Telluride’s festivarians turn gleefully eccentric for the Telluride Mushroom Fest. Mycophiles parade down Colorado Avenue in mushroom costumes, compete in a mushroom cook-off, and, naturally, hike into the woods to sniff out fungi and other edible goodies. Once the snow melts in Telluride, the ski town transforms into Colorado’s festival capital, attracting locals and visitors with events celebrating culture, from music to mushrooms. Image courtesy of Telluride Blues & Brews. The air cools early in Telluride and by September, gold-leafed aspens tint the hillsides. The festival season heads toward a close with a ceremonious, all-out bang: Telluride Blues & Brews, a sprawling gathering that attracts top blues musicians and headliners like Willie Nelson, Melissa Etheridge and the B-52s. More than 70 breweries pour craft beers for thousands of festivarians, decked in sun hats and costumes to celebrate fall. As with every other festival, the convivial mood seeps into every corner of town. Artists play small stages hidden in the campgrounds, and intimate shows pop up at historical saloons after the last main stage act finishes its encore. And it’s not uncommon for festival-goers themselves to take part in impromptu jam sessions. One evening, after all of the shows had wrapped up, I rambled through a campground following my ear to pop-up bands strumming amid the tents. I’d stand and listen for a while, then wander off, following the sound of a fiddle or a guitar or human voices harmonizing. I realized that people can’t help themselves but play. The mountains, the music, the moon overhead lighting up the cliffs and silver-plating the waterfalls — what could be better inspiration?